Beijing, China Daily, 09 Oct 2017 — With a record-high number of trips made during the past eight days, the National Day holiday, one of the most important times of a year in China, has inspired big changes in the way people travel. Usually, the National Day holiday runs from Oct 1 to 7 and is dubbed “Golden Week”. 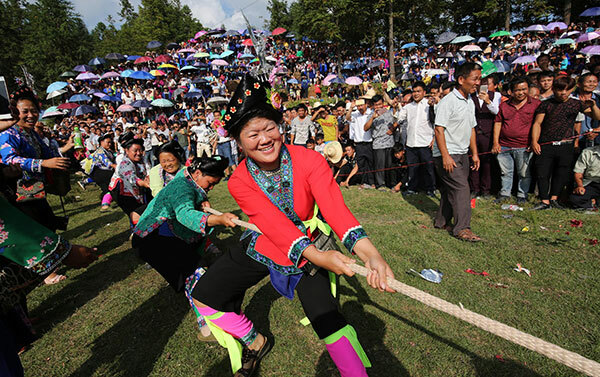 This year, the holiday was prolonged to eight days, as it coincided with Mid-Autumn Festival. The longer duration of the holiday enabled more people to take trips. Statistics from the China National Tourism Administration showed that 705 million trips were made during the eight-day National Day holiday this year, 663 million of them in the first seven days, up 12 percent from the seven-day holiday last year. Five years ago, 428 million trips were taken during the seven-day holiday. But the increasing number of trips is not the only change in the past several years. Rail travel, particularly on high-speed trains, has enabled more people to travel during the holiday. Estimates from China Railway Corp, the national rail operator, showed that about 40 percent of trips during the holiday were made by train, including on the Fuxing, the high-speed train developed by China that was put into operation in June and travels at speeds up to 350 km/h. At the same time, the free-of-charge policy on expressways during public holidays, which first went into effect during the 2012 National Day holiday, made it cheaper and more convenient for people taking road trips. This encouraged more people to travel by car. Yang Pei, 46, a resident of Dezhou, Shandong province, took his wife and daughter on a road trip to Tianjin during the holiday. On other days, a road trip between his hometown and the North China municipality would cost travelers 210 yuan ($32) to pass the toll stations on the expressways. In addition, tourists in China also used shared bikes more frequently during the holiday, which added convenience in urban areas and helped the environment. As of the end of July, more than 16 million bikes will have been put into operation nationwide. According to Ofo, one of the major bike-sharing companies, the usage frequency of its bikes increased by 15 percent during the National Day holiday. Carbon emissions were reduced by about 78,000 metric tons, it said. Zhang Min, a Beijing resident who traveled to Xi’an, capital of Shaanxi province, said shared bikes helped her when she was sightseeing in the city. “It’s really comfortable to ride a bike and appreciate the scenery in the mild autumn weather, not to mention that I don’t have to call an expensive taxi or wait for the always-crowded bus,” she said, adding that the occurrence of new things has given people more choices in their outing.